Members of the team from Osaka, Japan, came together for a photo with their exhibition opponents from Hingham High after the teams played. In the darkness of the JFK Library’s auditorium, the Hingham Harbormen, the reigning Division 2 baseball state champions, shifted uneasily in their seats. Nearby, jet-lagged students from Osaka, Japan, here on a weeklong exchange program with their baseball hosts, sat separately, erect and motionless. On the screen was a biography about John F. Kennedy that included World War II and the Japanese attacks. It was an awkward moment, but thankfully the past does not dictate the future. The following day was Baseball Camelot. The students held a joint practice at Hingham High School. 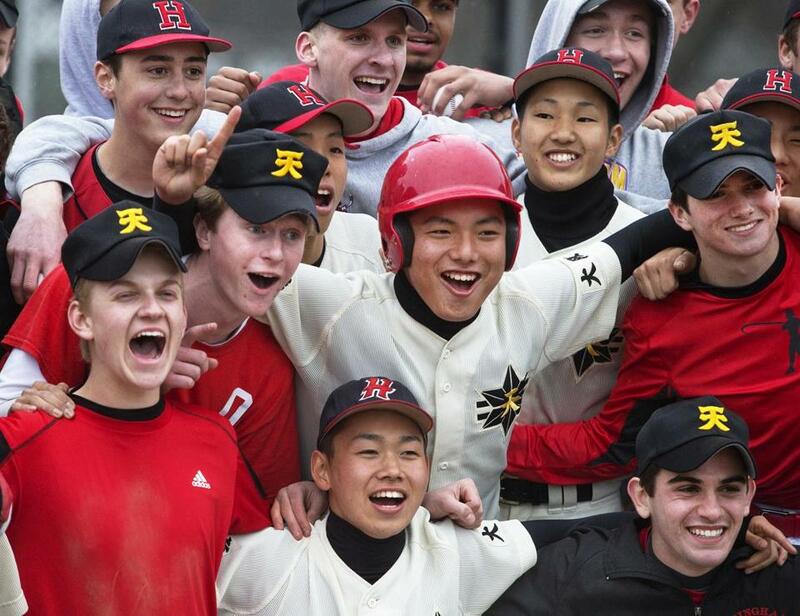 Something magical happened on the diamond between the 33 visiting ballplayers from Tennoji High School and their American counterparts. In the course of two hours, the two teams became one, cheering for one another and laughing out loud. Naoki Fujiwara, the Tennoji third baseman, said his fears quickly evaporated. Kei Saito, the shortstop and captain of the Tennoji team, agreed. Rick Swanson, the Hingham assistant principal and junior varsity baseball coach, said he had goose bumps at the practice. The exchange was conceived by Swanson in February 2013 after he screened the documentary “Kokoyakyu: High School Baseball” and held a webinar with the filmmakers. The visitors stayed with host families and shadowed their counterparts in school for a week last month. The sightseeing itinerary included a tour of Fenway Park, where the young Japanese players bowed to the Green Monster and received a ball autographed by Osaka native Koji Uehara from the Red Sox. They also attended a Celtics game, toured Harvard University, and hiked the Freedom Trail. The Osaka kids spoke some English, the Hingham kids spoke no Japanese, and there was only one interpreter. But it hardly mattered, because everyone spoke baseball. Hideshi Masa, the Tennoji manager, was thrilled with the experience. At the end of the joint practice, Masa impulsively ran over and bear-hugged Hingham’s Matt Nash after he made a good hustle play. The Hingham players were surprised. They thought the visitors would be more reserved. “It’s very natural for me when the kids make a good play, I hug them,” said Masa. The charismatic manager said the film at the library did not offend him; it was a teaching moment. Baseball in America is more free-wheeling than in Japan, where it is more disciplined, said Masa. The Japanese practice all year long, sometimes both before and after school. They play nine-inning games instead of seven. There are also some cultural differences. At school, the Hingham students and their guests planted seeds of kale and peas together during “Green Week” and were also taught how to carve baseball bats in shop class. Some of the host families in Hingham had nothing to do with the school’s baseball team. Alex Clark, 17, persuaded her parents to host Tennoji center fielder Kaito Nakamura, 17, for a week. Host mother Jean Beane, whose son Bobby Beane Jr., is an 11th-grader, said it was an amazing experience having Riku Yokote, the Tennoji catcher, stay with her family. “My biggest surprise was his room was equally as messy as my son’s room,” she said, laughing. The Japanese guests steered clear of sushi but loved the gourmet cheeseburgers at one of their sponsors, Wahlburgers. But Fenway was clearly the biggest hit. On the last full day, an exhibition game was played between the teams. It was highly anticipated by the Tennoji players but downplayed by the Hingham coaches. Most of the approximately 250 fans in attendance were rooting for the visitors. The smell of onions and sausages, grilled by The Sausage Guy, wafted over the third base line. Tennoji won, 3-1, on two long home runs by right fielder Jyunpei Miyata. After the last out, there was a cultural love-a-thon on the field. It was like David Ortiz hugging Koji Uehara 33 times simultaneously. 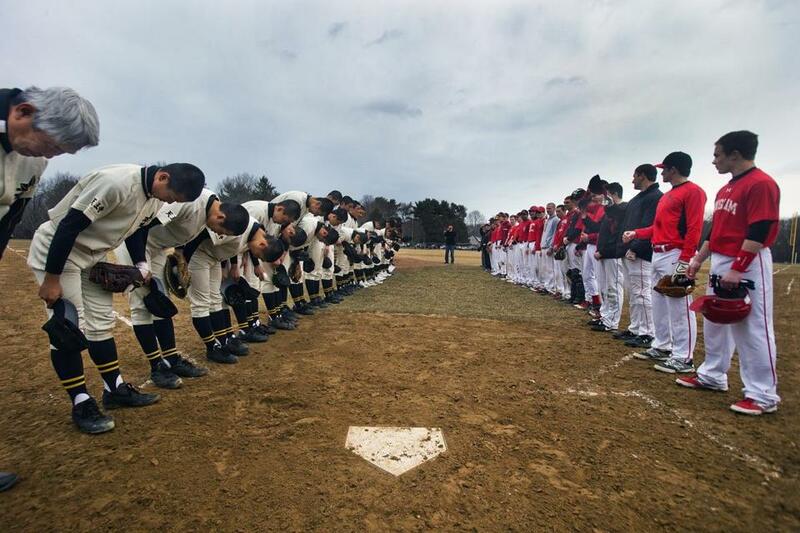 Tennoji players bowed to their opponents, the fans, and the field, and sang their school song. In an impromptu moment, the Japanese kids swapped hats with their American friends. One Tennoji player hugged a group of girls who had written — incorrectly, it turns out — a sign of support in Japanese. The hosts also delivered hot dogs to the victors, who quickly wolfed them down. If only peace with North Korea could be so easy. Members of the Tennoji team bowed to their opponents before the teams’ scrimmage. Outfielder Masato Yamaguchi was asked where he’d rather play baseball, in the United States or Japan. There was silence as he thought. Bearden said he felt sad that the guests were going back to Osaka. A mural depicting Japanese baseball was painted by Hingham students Ali Weaver and Emma McKeon-White inside the school — a constant reminder of their new friends, still connected by social media. 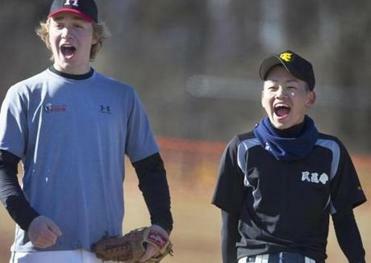 But Hingham second baseman Kyle Lussier, who has a mini-Fenway in his backyard, said he missed the after-school Wiffleball games with his Osaka buddies. There was even praise from the Japanese guests for things most high school kids diss. 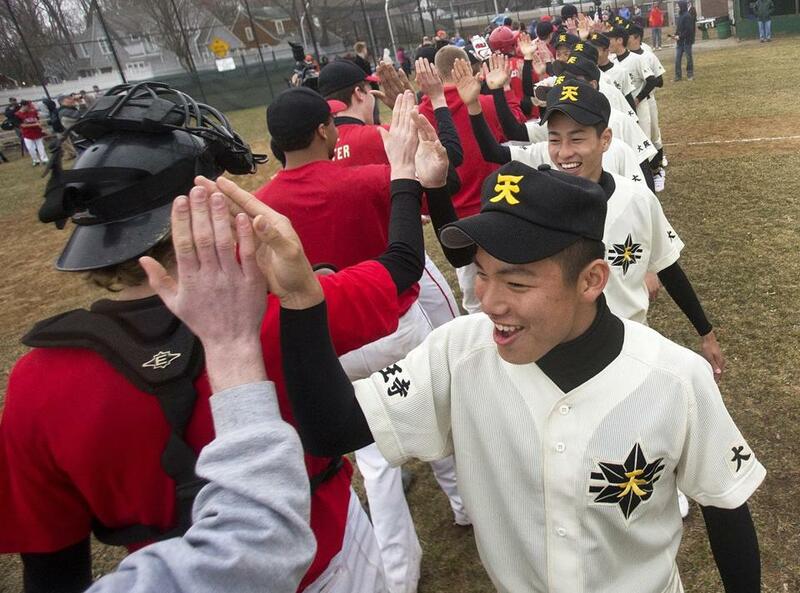 Riku Yokote led Tennoji players as they high-fived their Hingham counterparts after the scrimmage.